A little over three years ago, on January 11th, 2011, I wrote a blog around this letter, which appeared in the New York Daily News. Frankly, I felt sorry for the guy, he was 63 after all. I didn’t even imply that he might have gone a little senile. I fail to see the problem here. 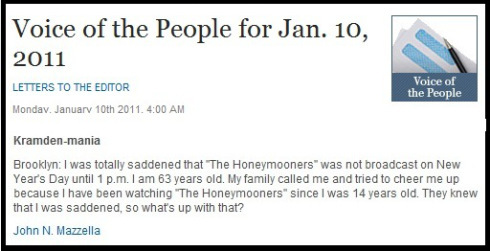 They aired The Honeymooners at one in the afternoon on a day when most people are home and sleep late. Should channel 11 have shown it at one in the morning and forced an old man to stay up to the wee hours of the night? Did he really want to be up, at age 63, watching TV at 4 am? Is this an overreaction, or can someone explain this to me? And while you’re at it, explain to me why this guy felt the need to write to the newspaper about it. How many letters did he send in that I missed over the years? How many love letters has he sent Audrey “Alice Kramden” Meadows? And how many times has he bitten someone’s hand when they tried to change the channel?